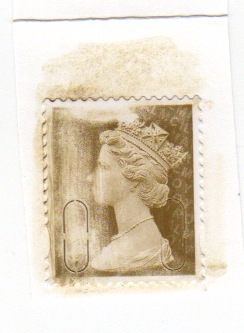 The Machin Maniacs blog has described one way to remove these stamps from paper. (You'll remember that the water-soluble layer between stamp and adhesive has now been abolished.) But that blog does advise against lighter fuel due to the carcinogenic properties of the fluid. I received my first security stamp in the mail yesterday (thanks, Alan) and much as I wanted to keep it as a piece of postal history I have experimented in the interests of philately! It smells pleasant enough - of orange - and some say it is basic orange juice. The bottle is marked as a poison, with a warning that lung damage can occur if swallowed. The constituent chemicals are not mentioned on the label - I found this note from the "Wycombe Area MG Owners Club” Newsletter. The active ingredients (among other things) are ethanolamine and petroleum­ based hydrocarbons. I dried the stamp overnight, and the 'grease' marks disappeared. My stamp is still sticky, which poses some questions for storage, but at least it means that it can be stuck to other paper and I won't have a mix of manilla, white, red, azure and cream backing papers to my Security Machins. At present I have it stuck to backing paper from some self-adhesive labels. I'll be interested to hear from other experiments. This wasn't just any after-shave, it was M&S After-Shave! Change the name to QE11 after shave, (copyright) should we market this? :-) Amazining Ian, I also tried harpic which destoyed the print. Airwick which made it smell lovely, but did not touch the gum aspect and stuck the stamp better. I think it all boils down to the alcohol in the product at the end of the day.